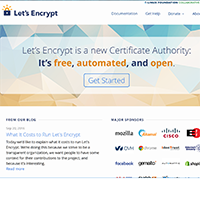 Because privacy & security online is becoming ever more important I wanted to secure my website with a SSL certificate. I had to read the manual and check some examples before I was able to install the certificate. My domain is registered with a third party and my website(s) are on another third party which was making it a bit harder to implement. I am very happy with their free service and I support their filosophy trying to make the internet an as safe environment as possible.